Through Kleuren voor Volwassenen (Coloring for Adults) I received the super nice One and Only Mandala Coloring Agenda 2017 from BBNC, for which I thank them! Now it’s quite clear that I must write a review about it haha, so that’s what I’m about to do. The size is 18 x 17,6 cm groot and 2,4 cm thick. Not very small, but neither as large as the coloring agenda from a previous review I wrote. And my handbag is big enough to stow it away and be able to carry it anywhere, if I wanted to. I’ve made a video again of the inside. And I’ve filmed it all, therefore it turned out to be quite a long (and boring) video. So with the montage I sped it up. Everything is still in the video, and it doesn’t take that long to watch! 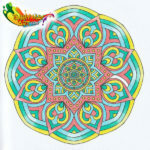 The first mandala that I colored has a funny story to it, but that would be too long to share in this review. So I’ll write a blog about that soon. I’ve colorized this one with the Faber Castell Pitt Brush pens. 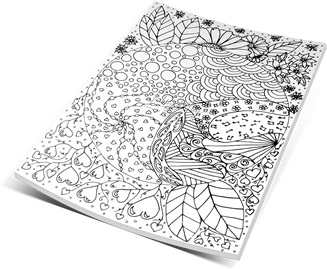 The paper is very suitable for coloring with pens or water-based markers. I wouldn’t use alcohol markers, since they always bleed through. 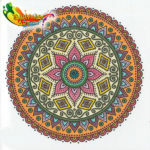 The paper of this mandala coloring agenda is thick enough though for water-based markers or pens to not bleed through. And like I said, working with the Pitt Brush pens on this paper was a delight. They drew smoothly, gliding over the paper, without the ink being sucked into the paper. So everything was covered even, without becoming blotchy. Ideal in my opinion. Not much later I bought the Lyra Art pens, also water-based. These are similar to the Stabilo 68 pens and I had promised someone to write a review about them. So I decided to try them out in the mandala coloring agenda. What a disaster that was! The paper responded to the pens like it would tear, the result was blotchy, truly horrible. And the paper wasn’t to blame, as you can read in my review about the Lyra Art pens. It was very frustrating to have to work like this. When you now run over the paper with your fingers, it feels like it was roughly sanded. This was not the case with the first mandala, the paper there is still soft as silk. And to make matters worse, the Lyra pens did slightly bleed through to the back of the page. Not totally, but enough to be visible and annoying to me. What a pity! To be able to make a good comparison between the Lyra Art pens and the Stabilo 68 pens, I’ve decided to colorize another mandala with the latter. I’ve picked similar colors as I used with the Lyra pens. Fair enough, the paper does feel a bit rough as well after finishing this third drawing, but not nearly as rough as mandala number two. The coloring itself went very well. I really like working with the Stabilo 68 pens. And they didn’t bleed through to the back of the page! Because these pens worked so much better to colorize with, I was able to do a bit more with gradients and blending. For this I’ve used a Tombow blender pen. To wrap this review up nicely, I decided to colorize a fourth mandala. This time I wanted to use colored pencil and I’ve chosen to use the Caran d’Ache Luminance. 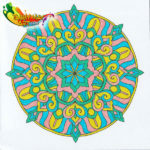 The paper of the mandala coloring agenda was very good for working with pencils. I could easily blend, the pencils did exactly what they had to do and the combination with the paper was a real pleasure. This agenda is really lovely! 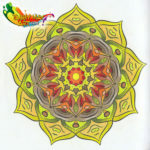 And I think the mandalas in it are great to colorize. There’s a large variation in the drawings, from very plain to more complicated designs. Because of the size it’s fairly easy to colorize a quick mandala inbetween, without having to spend hours to finish it. The writing space for the days in the agenda itself is large enough. At least for me, I don’t need that much writing space. The rest of the extra pages is also good, like the year planner, the page for your personal data, space for notes and four pages for doodles or testing your colors. So in short, I like it and will definitely use this agenda next year! 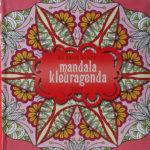 Would you like to have your own copy of this cute mandala coloring agenda? Then order it now for € 14,99 through Bol.com by clicking here, or below on the picture or the link. Did you like this review? Then please share it on Facebook and Twitter. Thanks a lot! Leuk weer, prettig ook dat je materialenvergelijkingen maakt!